I pass through these doors and or see these words on a daily basis, but do I stop to think about the message they are sending? Work – exertion or effort directed to produce or accomplish something. Serve – to render assistance; be of use. When I started this blog I wanted a place where I would feel accountable to myself. A place to post the best of a daily challenge I had set out to accomplish. I also build in a small measure of grace knowing it might prove impossible to post daily… I have learned well Life Happens. 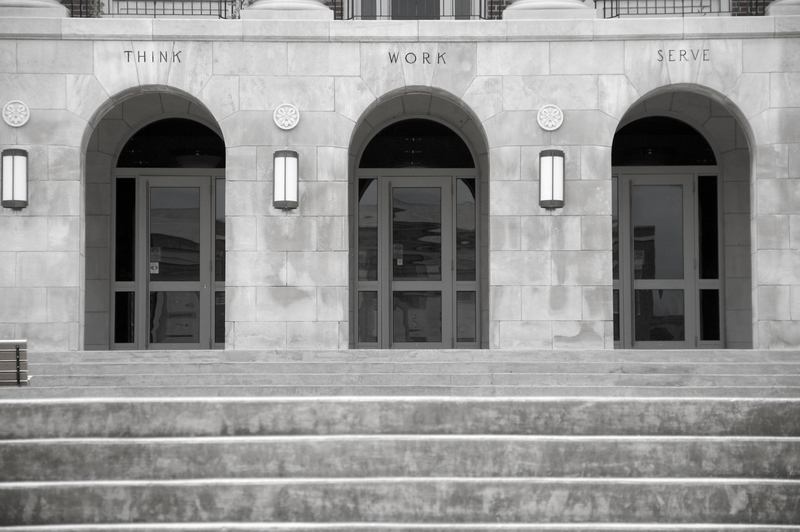 The motto for the University I work at is THINK – WORK – SERVE. I hope in a small way this blog can also follow in this path. Not just meaningless rambles of an individual hoping to think about the pictures she will take, make the effort to exert herself to find and accomplish the idea, but also to serve to impact my world for the better in some small way. Loft aspirations for a nerdy girl like me but I think well worth it.